Leading Manufacturer of solar pv dc surge arrester from New Delhi. The guaranteed service life of 20 years or more is offered for their system by most of the solar module manufacturers. The cost of the modules are justified by calculating this long period of operation. However PV installations are very much exposed to the lightnings and surges/transients. Not only house owners install a PV system on their rooftop but also private companies make more and more investments in shared systems, which are erected on large-surface roofs, on traffic structures or unused open areas. Because of the big space requirements of the photovoltaic generator, PV systems are especially threatened by lightning discharges during thunderstorms. Causes for surges in PV systems are inductive or capacitive voltages deriving from lightning discharges as well as lightning surges and switching operations in the upstream power supply system. Lightning surges in the PV system can damage PV modules and inverters. This can have serious consequences for the operation of the system. It may leads to high repair costs and system failure can result in considerable profit cuts for the operator of the plant. Since the surge protection device shunts the transient/surges to the earth, a low impedance good conductivity earthing, at the same potential is critical for the surge arresters to function properly. Equipotential bonding has to be done for the protection scheme to work efficiently. HAKEL, a Czech Republic company offers a complete range of surge protection solutions specifically for the photovoltaic market. 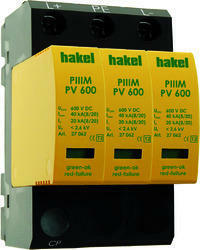 HAKEL surge protection devices are high performance solutions complaint with the international standards in order to ensure the efficiency and reliability of the photovoltaic system. 1. AC SPD: The output side of the PV inverter where the AC power supply is fed to the load. Depending upon the power supply system, Single or Three phase AC SPD is recommended. 2. DC SPD: The power supply which is fed into the inverter is of DC which flows from PV modules and are exposed to the lightning & induced surges. Suitable DC SPD ratings (200, 400, 600, 800, 1000V DC, etc) is recommended. 3. DATALINE SPD: Some of the PV installations are connected to the central monitoring system through the datalines (transmitters, receivers, modems, etc) which may get effected by the lightning & induced surges. Suitable DATALINE SPD is recommended. SPUM PV is surge arrester type 2 according to EN 61643-11. Complete device consists of a base part and pluggable modules. These arresters are recommended for use in the Lightning Protection Zones Concept at the boundaries of LPZ 1-2 (according to IEC 1312-1 and EN 62305 ) for equipotential bonding of positive and negative busbars of photovoltaic systems and elimination of transient overvoltage that originate during atmospheric discharges or switching processes. Failure indication of these disconnectors is partly visual (Green-Ok/ Red-Fault) and partly remote monitoring by potential free switching contacts (only SPUM PV* DS type).